The Valencia Orange Refresher is the newest addition to the lineup of green coffee-infused juice drinks from Starbucks. Like the Lime and Hibiscus flavors it is definitely refreshing and a good way to cool down on a hot summer day. The lime Refresher translates very well to a homemade version and I decided to use fresh orange juice to recreate the orange option at home, as well. 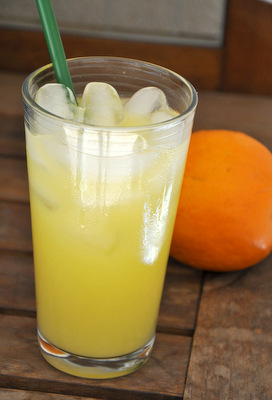 The drink is made with orange juice that is lightly sweetened with confectioners’ sugar. The sugar helps to boost the orange flavor a little bit, since the refreshing drink is primarily made with water and not with orange juice. Fresh orange juice, with all the pulp removed, is going to give you the zestiest orange flavor, but a good quality storebought juice with no pulp will work, too. The drink is a bit sweet and still has some tang from the orange, and comes pretty close to the Starbucks version. Like my Homemade Cool Lime Refresher, this homemade refresher doesn’t use any green coffee bean extract, but it is definitely refreshing and captures the flavor of the Starbucks original! In a large glass, combine orange juice and confectioners sugar. Whisk to combine, ensuring that the sugar is completely dissolved. Add water and ice and stir well before serving.